That's right. It's that time again action fans. If you enjoyed the first season then be prepared because everything to love about the first is back. From Date Masamune's attempts at speaking english phrases, the Tiger of Kai punching Yukimura through the ground and into the sky during regular conversation, massive explosions from sword swings, and over the top EVERYTHING! We start with our three main groups in a battle against each other for conquest of territories. We have the Tiger of Kai and his forces facing off against Kenshin and his troops. Sanada Yukimura and Date Masamune are facing off nearby as should be expected (they're the main characters after all) and Masamune actually beats Yukimura. Unexpectedly, another group arrives with thunder clouds looming overhead (apparently Nobunaga isn't the only one that can make storm clouds follow him). Toyotomi Hideyoshi appears and his troops have already surrounded the battlefield. He demands they join him and prosper or suffer imminent death. Obviously, our main characters aren't backing down and Masamune is ready to face this mammoth of a General on head first. When I say mammoth, I mean it, Hideyoshi is literally a freaking Titan! 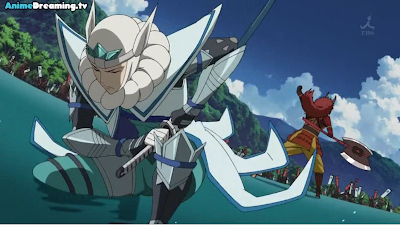 Not only is Masamune not even half his height but this guy doesn't even bring a weapon into battle. He doesn't need one. One swing of his arm sends back countless arrows to the archers that released them and a raised fist to the sky forces the clouds to separate to allow light to shine through. This guy is scary. After the groups manage to escape, we switch to Keiji, Toshi, and Matsu having a discussion about Hideyoshi. Apparently they know the titan and Toshi is in an alliance with him (similar to how Toshi joined Nobunaga in season 1 but for different reasons this time). This is actually the first time I've seen Keiji and his monkey sad faced. Then we have an injured Yukimura discussing war strategies and tactics with the Tiger of Kai in typical fashion with the Tiger of Kai pounding the ever loving crap out of Yukimura. I don't know which punch I liked more... the one that seemed so unexpected and knocked Yukimura off screen or blasting him off like Team Rocket and Yukimura comes running back up moments later as if he wasn't knocked all that far. I don't know about you but I find it hilarious. 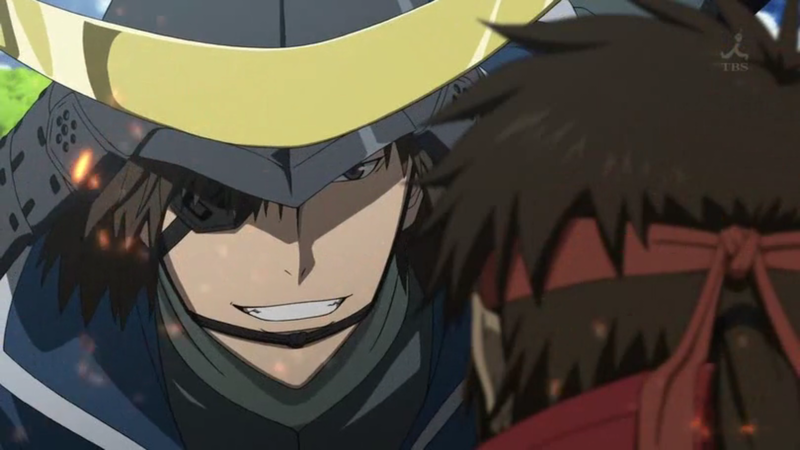 It seems that Mouri might be teaming up with Hideyoshi and the plan is to send Yukimura to the West on his own. Then we have the traditional screaming at each other as a ritual of bonding. Data Masamune and Kojuro discuss their strategy and they have come to the conclusion that the only way Hideyoshi would have known when to strike was because their is a traitor in the war council. They decide to go spy hunting first thing in the morning. That night while Kojuro awaits to see if anyone flees, Hanbei (right hand man that looks like a woman for Hideyoshi) shows up and wants Kojuro to join them. He brings along hostages to help Kojuro make his decision. What a nice young fellow. This is Kylak signing out and tempted to jerry-rig my katana to explode on impact. Just kidding folks, that would be a horrible idea. Don't try this at home.